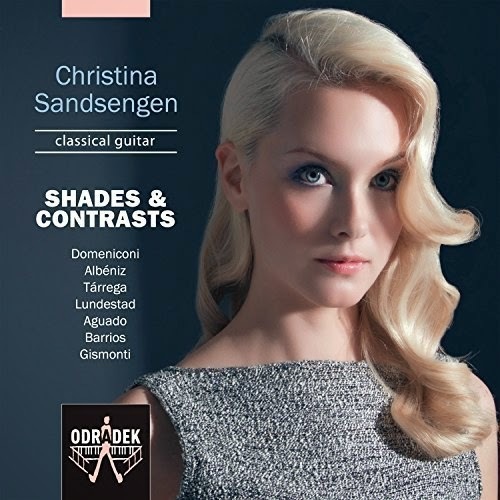 Christina Sandsengen is a young Norwegian classical guitarist and on this new disc on the Odradek label she has assembled an interesting mixture of new and old works, under the title of Shades and Contrasts. Alongside music by Isaac Albeniz and Francisco Tarrega she plays music by Carlo Domeniconi, Sven Lundestad, Dionisio Aguado, Agustin Barrios Mangore and Egberto Gismonti. Christina Sandsengen's own introduction to the works on the CD cover is perhaps a bit over the top, 'The classical guitar is the key to my unconscious world of emotions, where I explore the contrasts and shades of live. If a piece moves and captures me while hearing it, I feel compelled to play it, as if I had some special bond to it even before seeing the score', but there is certainly an interesting mix of works on the disc with many that I had not come across before. And if the music does not quite have the shades, contrasts and extremes of emotions that we are led to expect, there are some real discoveries to be made and Christina Sandsengen is clearly a guitarist of talent. She opens with the suite Koyunbaba by the Italian composer Carlo Domeniconi (born 1943). The CD booklet talks about Domeniconi's fascinating with Turkish music and his incorporation of Turkish folk idioms into his music, but listening to the suite blind I found that it seemed more Spanish than anything else. Perhaps this is because Domeniconi uses a wide range of classical Spanish guitar techniques, and with these creates a series of highly attractive textures. Perhaps the work does not challenge the listener as much as it could, but there are modernisms in the harmonies too. The two works by Albeniz are both arrangements. Mallorca was a piano piece written in emulation of Chopin (who famously visited Mallorca) and uses a lovely barcarolle-like structure. Christina Sansengen brings a lovely lyrical singing line to the melancholy melody. Asturias succeeds in being very guitaristic; despite being another piano work it is intended to be an evocation of flamenco. Francisco Tarrega's Lagrima is a lovely little piece full of charm, and the anonymous (and very well known) Spanish Romance is also sometimes attributed to him. Tarrega was a great guitarist and friend of Albeniz. Sven Lundestad (born 1950) is a Norwegian guitarist and his Late at night has a lovely bluesy feel to it. A tiny piece, you wanted to hear more. Dionisio Aguado (1784-1849) was a Spanish guitarist and composer, he was a friend of the great guitarist/composer Fernando Sor. Aguado's Andante and Ronde is piece with great charm and melodic interest. Agustin Barrios Mangore was the first guitarist from South America (he was from Paraguay) to become internationally celebrated. His name is a stage name, adopted in the 1930's and he seems to have been a bit of a character and would appear on stage wearing a Guarani headdress. La Catedral was inspired by a visit to Uruguay and the Cathedral of San Jose. In three movements, it manages to combine modern and traditional elements in the harmony, with a clarity of texture (Mangore was much influenced by the music of JS Bach). The Brazilian composer, guitarist and pianist Egberto Gismonti (born 1947) wrote Agua e Vinho in 1972 and it is full of highly evocative melancholy. This is a disc full of music from interesting corners, and I certainly enjoyed exploring. Christina Sansengen is clearly a guitarist of talent and on this disc shows herself at the top of her game. I am not quite certain that the particular mix of music works as a complete programme, but as something to dip into it is full of treasures.